Abstract: Recognizing differences in the standards of orthodontic postgraduate education across Europe, the European Board of Orthodontists was established in 1997 with the aim of providing a standard against which an orthodontist could be judged independent of national barriers and, in so doing, promoting high standards of care. This article describes the experiences of both authors who sat the assessment at the June 2018 diet held at the European Orthodontic Congress in Edinburgh. Clinical relevance: Application for membership to the European Board of Orthodontists requires clinicians to work towards illustrating well-described and applied clinical procedures to correct significant orthodontic problems to an identified excellent standard. In the pursuit of attaining this recognition, orthodontists will invariably reflect on the treatments they provided and undoubtedly learn more, as well as seeing improvements in the standard of their patients’ care. Author notes: Catherine Brierley, BDS, MFDS RCS(Ed), MOrth RCS(Ed), Post CCST in Orthodontics, Chesterfield Royal Hospital/Charles Clifford Dental Hospital and Trevor Hodge, BDS, MFDS RCS(Ed), MOrth RCS(Ed), MPhil(Orth), FDS(Orth) RCS(Ed), FDS RCS(Eng), FHEA, FDTFEd, Consultant Orthodontist, Leeds Dental Institute, Clarendon Way, Leeds LD2 9LU, UK. 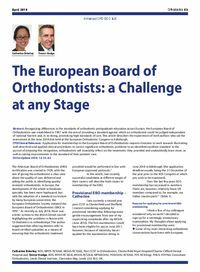 Objective: To explain the two different routes to achieving membership of the European Board of Orthodontists, what is involved in preparation for the examination, and what the examination itself entails.